Windows 10 has its features enhanced, making our technical lives move on with an ease. Microsoft, when it launched Windows 10, also added upon a ton of new keyboard shortcuts that would help you have more easy access to the new enhancements like Cortana, Action Center, Task View and Virtual Desktops. Recently it has also introduced a cheat sheet that would further boost up your technical skills. We will present you with some must-know keyboard shortcuts with which you can increase your performance, speed of ease and make learning new things easy on your Windows system. If you are new to the keyboard shortcuts,then a whole list of shortcuts may overwhelm you. Also many of these features might also work of the older versions of windows like those of Windows 7/8.1. In order to make your work easier, we introduce to you the most important shortcuts,which, undoubtedly are highly beneficial. 1. Ctrl + T – It helps you open up a new tab. 3. Ctrl + L – It highlights the URL of the page. 4. Ctrl + Tab – It cycles through the currently open tabs. 1. 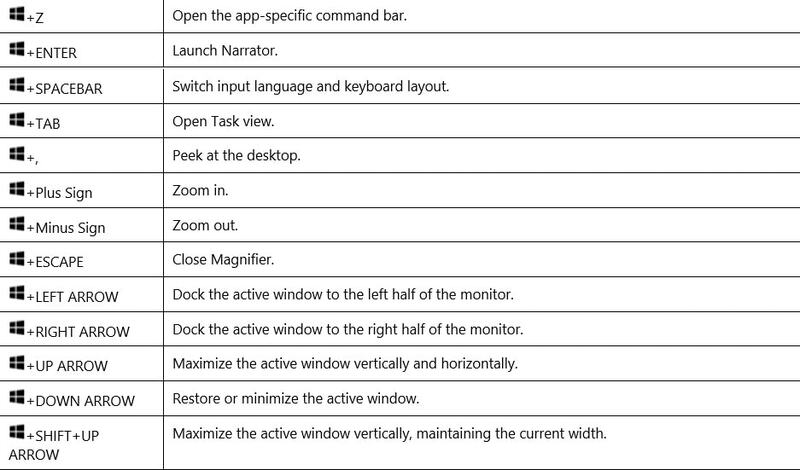 Windows Key +A – It enables you to open up the Action Center. 2. Windows key + C – It enables you to launch the Cortana in listening mode. This is especially useful for voice based commands. 3. Windows key + Tab – It enables you to open up the Task View. 4. Windows key + I – Open up the Settings App for changing the various settings like themes,time,etc. 6. Windows key + Ctrl+ D – It helps you create a virtual Desktop. 8. Windows key + Ctrl + Left or right arrow – It helps in switching between virtual desktops. 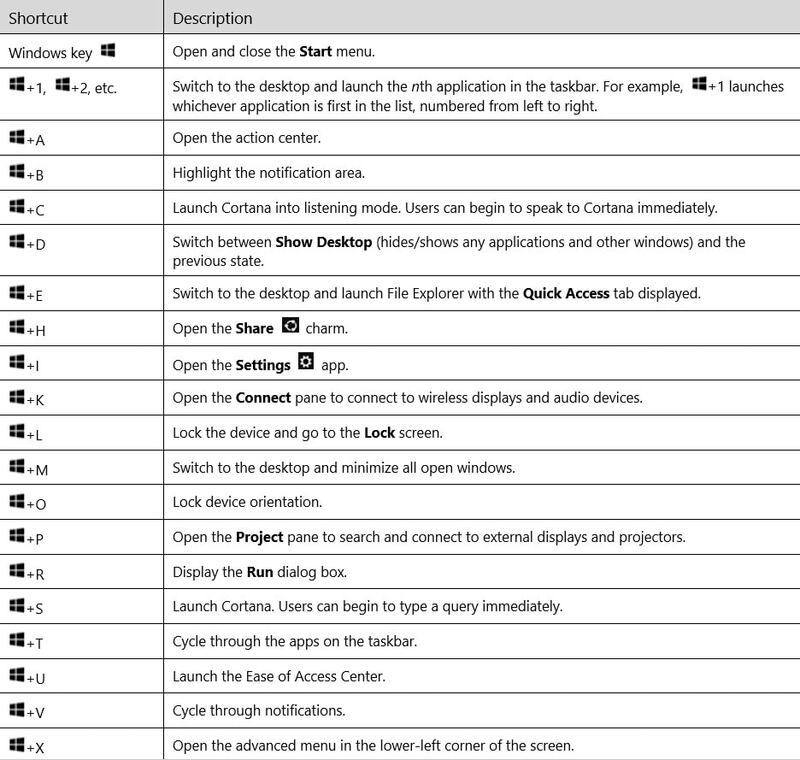 The shortcuts Given below works for lower versions of Windows also. 9. Windows key + X – Open up the list that appears when you right click on the start menu. 10. Windows key + E – It helps in launching the File Explorer. 11. Windows key + L -It is used in locking the desktop. 13. Alt + PrtScn – Take screenshot of current window and copy it to the clipboard. 14. Windows Key + PrtScn – Take screenshot of window that gets saved in Computer>Pictures>Screenshots. Try out the above shortcuts and lower the dependence on your mouse for a while!